The three elk that El Jebel Blacksmith Vaughn Shafer and sculptor Thomas Barlow were commissioned to make for the El Jebel roundabout. 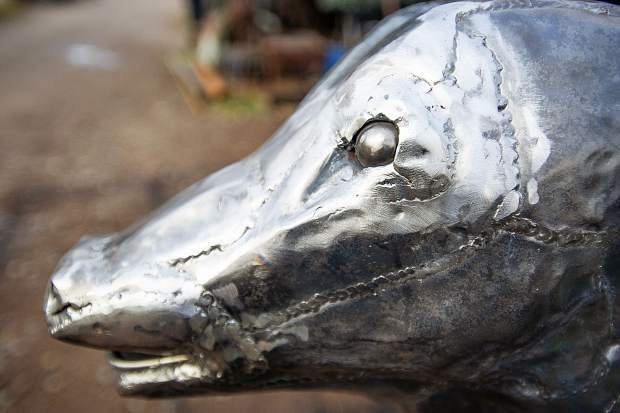 A detail of the elk calf that will be going in the El Jebel roundabout. 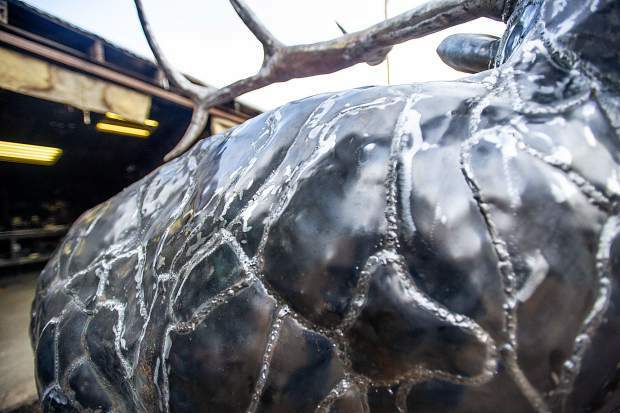 A detail of the torso of the completed bull elk of the three elk that El Jebel Blacksmith Vaughn Shafer and sculptor Thomas Barlow were commissioned to make for the El Jebel roundabout. 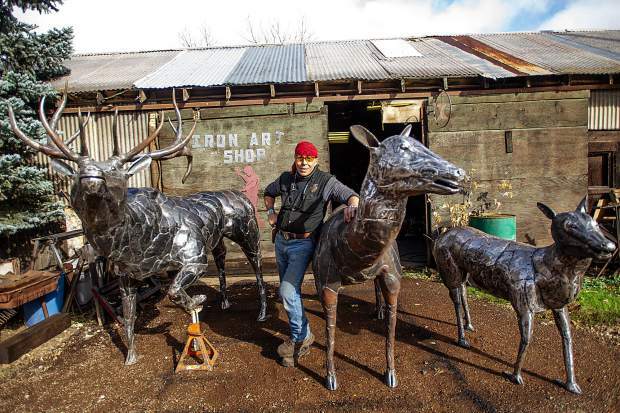 El Jebel Blacksmith Vaughn Shafer poses with three elk he and sculptor Thomas Barlow were commissioned to make for the El Jebel roundabout. 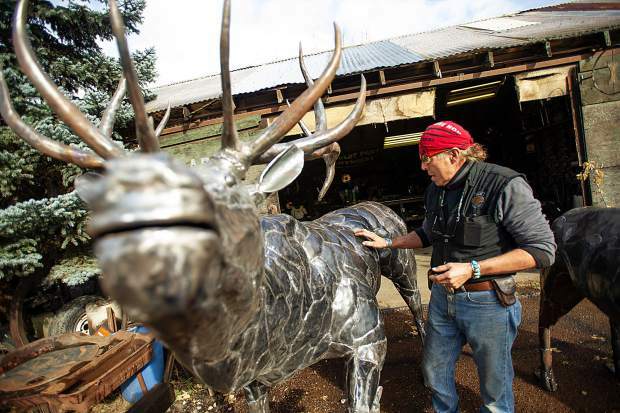 The completed bull elk of the three elk that El Jebel Blacksmith Vaughn Shafer and sculptor Thomas Barlow were commissioned to make for the El Jebel roundabout. 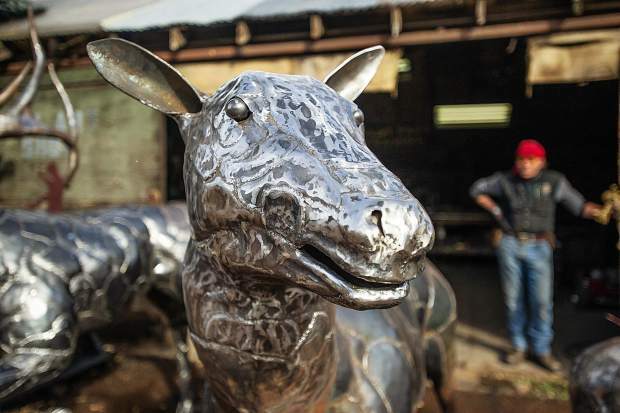 The completed cow elk of the three elk that El Jebel Blacksmith Vaughn Shafer and sculptor Thomas Barlow were commissioned to make for the El Jebel roundabout. 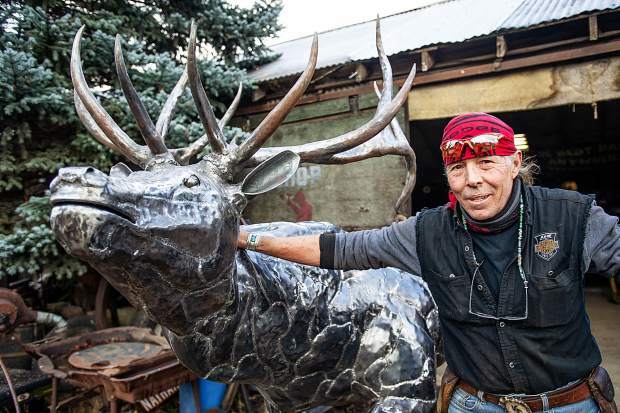 El Jebel Blacksmith Vaughn Shafer poses Wednesday with the bull elk he recently finished. 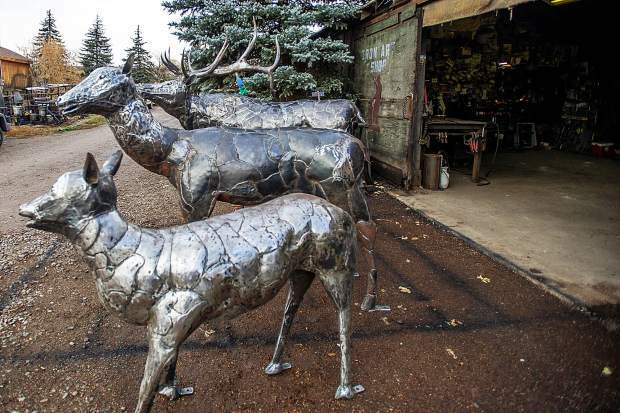 Shafer and sculptor Thomas Barlow were commissioned to create three handcrafted, metal elk for the El Jebel roundabout. When: Saturday, open house from 9 a.m. to 5 p.m.
It’s elk season in El Jebel and midvalley residents are being invited to help celebrate in a way that will resonate in 50 years. 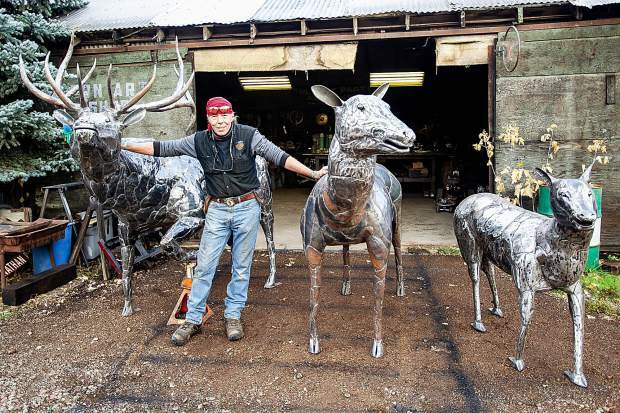 Blacksmith Vaughn Shafer and sculptor Thomas Barlow have completed three handcrafted, metal elk — a bull, cow and calf. They will be bolted into place later this fall in the center of the roundabout in El Jebel Road. The elk are unique enough, but Shafer had a special trick up his sleeve. He left an opening in the elk where he can insert time capsules. 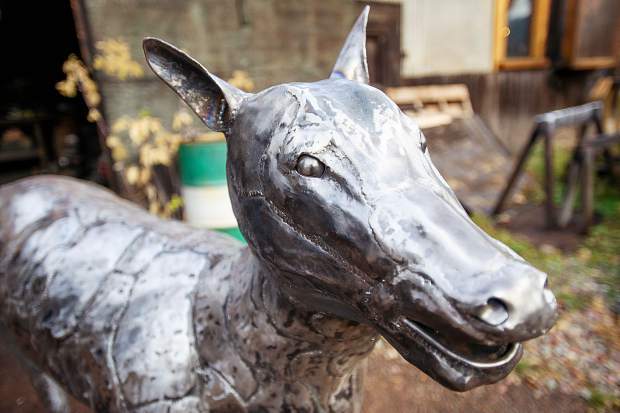 People throughout the Roaring Fork Valley are invited to attend a celebration Saturday at Shafer’s blacksmith shop and contribute something for the PVC pipe time capsules (see related info box). “People can put in notes or letters to their grandkids,” Shafer said. Some people have already stopped by to get pictures of their kids sitting on the elk. They are having prints made to put in the capsules. Shafter collected Aspen Times newspapers covering the Lake Christine Fire in July. He wants people to realize in 2068 how close Basalt and El Jebel came to getting roasted. Shafer said some residents who were evacuated because of the fire threat are bringing their proof of residency cards into the capsules. The cards were required for residents to return to their homes. The bull elk will hold between 15 and 20 time capsules. If there is more demand than space, the cow will be opened up. “It’s not like we’re going to turn people away,” Shafer said. 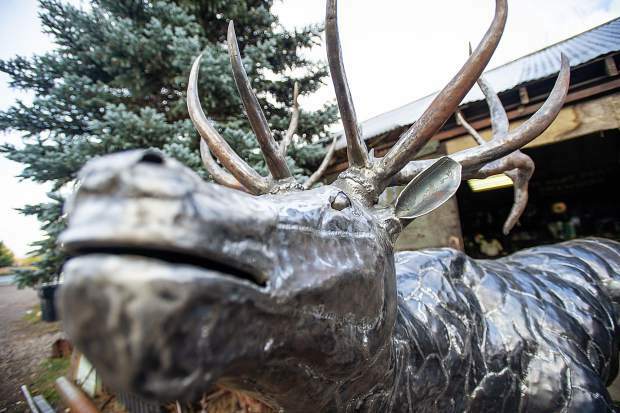 The elk will be on display outside Shafer’s shop Saturday in all their grandeur. His forge will be fired up and he will be demonstrating blacksmithing techniques. Local restaurants are contributing food and beverages. The two men spent eight months on the project, putting in a combined 30 to 40 hours per week. They used pictures of elk, studied ungulates at the Crawford family’s nearby elk ranch and even had outfitter friends bring them legs and hooves from animals harvested this season during bow season. Barlow prepared renderings and final sketches, and then they went to work. They used three-quarter-inch metal piping for the frames, then cut small pieces of metal from 4-by-8-foot sheets of metal for the exterior. They hammered the pieces into shape on an anvil and fitted them onto the skeleton. Once hammered into placed, they were welded. “It’s like we were working on pieces of a puzzle,” Shafer said. Smaller metal pieces were used on the magnificent, life-sized bull to give it more muscle tone. They estimated he weighs 800 pounds. The rack alone weighs 80 pounds. The elk are anatomically correct. They have eyes and realistic-looking hooves. They used more than 10,000 pieces of metal, including the infrastructure, and 800 pounds of welding wire. “Our challenge was monotony, staying with it,” Barlow said. Shafer said it was a great project to demonstrate what they are capable of creating. 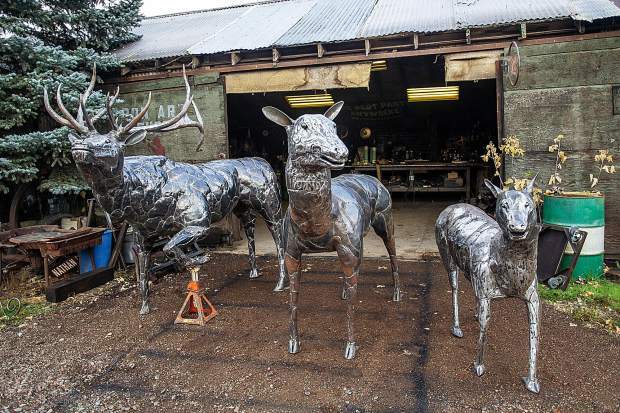 The elk will be in a visible spot, so they are hoping to get commissioned to create other pieces, elk or otherwise. “We’re hoping it will put a real feather in our cap,” Shafer said. 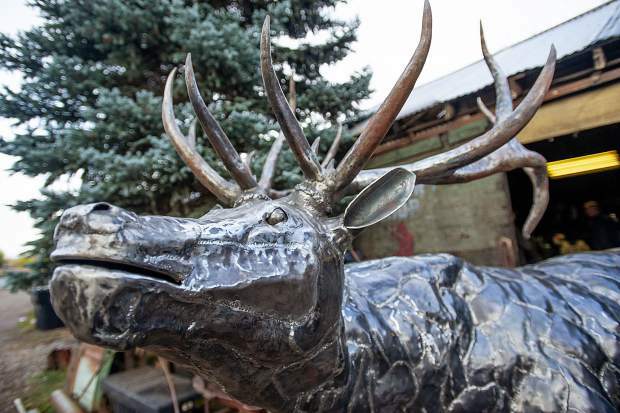 The Crawford family, whose corporate entity owns much of the El Jebel residential and commercial property, was the prime sponsor of the elk sculpture. It will be up to descendants of the Crawfords to open up the elk and unseal the time capsules in fall 2068. Alpine Bank also contributed to the project. Additional contributions are being sought to help compensate Shafer and Barlow for their time on the project. After Saturday’s ceremony the elk will receive a powder coating to preserve the exterior. 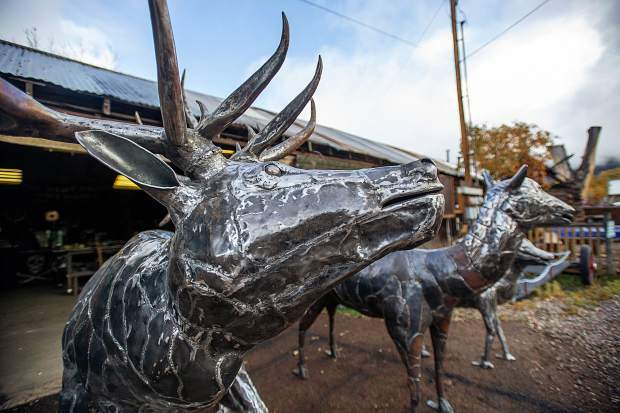 They will be bolted onto concrete bases in the roundabout one of the following two Saturdays, giving El Jebel an artistic element that matches the other towns of the Roaring Fork Valley. In addition to the satisfaction of creating such beautiful pieces, Barlow is thrilled the project is finished for another reason. “No more critiquing,” he said, explaining that hunting friends have been sticklers on details and not shy with suggestions.